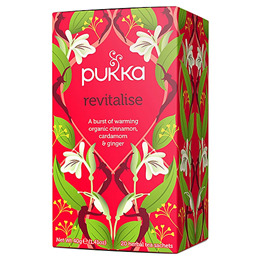 Pukka Revitalise Herbal Tea warms and invigorates with organic cinnamon, cardamom & ginger. An aromatic blend full of flavour and incredible organic herbs. Cinnamon bark (26%), orange peel, elderflower, cardamom pod (10%), licorice root, ginger root (7%), sencha green tea, spearmint leaf, clove bud, black peppercorn. Infuse in freshly boiled water for 5 minutes. 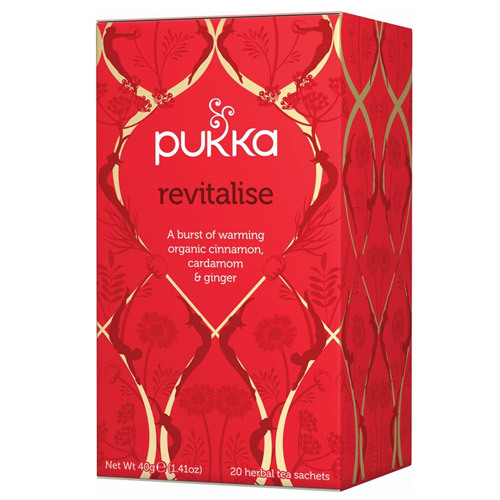 Below are reviews of Pukka Teas Revitalise - Cinnamon Tea - 20 x 4 Pack by bodykind customers. If you have tried this product we'd love to hear what you think so please leave a review.